If you read my previous post on this wine from Thanksgiving you will remember that I was a little disappointed. Last night we had some friends over and I dug deep into the cellar, really deep. 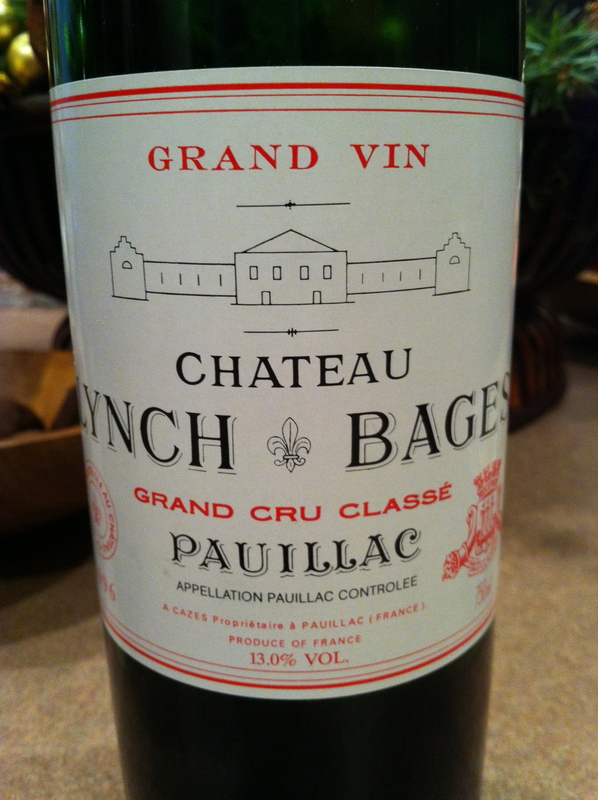 We kicked off the night with the 1996 Lynch Bages, and I was really happy. What I was expecting was there, the depth, complexity, primary/secondary flavors, and the tannins are holding it all together quite nicely. Interestingly enough, I opened a 2001 Lynch Bages at my parents house for Christmas dinner and was really crushed, it was missing everything; fruit, tannins etc- until I figured it out. I was using the wrong glass. They are not red wine drinkers and thus have no decent stemware to handle such a beast. Last night’s bottle showed beautifully in the BAG (Big Assed Glass, see previous post in case you missed it). What a difference the correct size and shape will make to the enjoyment of a decent bottle. Definitely a 5 star wine, and considering the bottle variation from Thanksgiving, this one would merit 94 points from a pro, which I am not.